West Sikkim is all set to host the celebration of World Tourism Day 2018 on this year theme ‘Tourism and the Digital Transformation’ with series of workshops, adventurous tourism and other activities this September. Although the World Tourism Day falls on September 27 but the series of activities will be starting from this week. The main function of the World Tourism Day will be held on September 26 and 27 at Pelling senior secondary school ground. The celebration is being organised jointly by the Tourism & Civil Aviation Department, West District Administration and West District Tourism Society (WDTS) with the support of tourism stakeholders of West Sikkim. A State-level celebration committee has been constituted headed by Tourism Minister, Ugen T Gyatso Bhutia and UDHD Minister NK Subba as the chief patron and other MLAs of West District as patrons. The committee has District Collector (West) as chairman, WDTS president, Karma Chuki Bhutia as vice-chairman, WDTS general secretary and Sushil Tamang as working president. 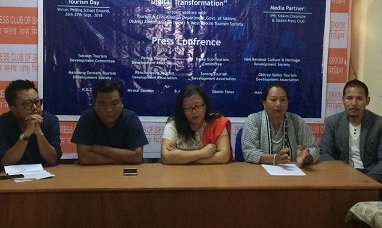 Addressing a press conference here on Monday, the celebration committee vice-chairman, Bhutia stated that it was a big opportunity for tourism stakeholders of West Sikkim to host the state-level World Tourism Day for the first time in West Sikkim district. She mentioned that West Sikkim has been naturally blessed having the world heritage site, Kanchenjunga National Park and huge flora and fauna. She added that historical sites and monuments and important monasteries of Sikkim were also present in the district, which depict the history of Sikkim. “So this is a golden opportunity for us to promote tourism interest places of West Sikkim nationally and internationally. We are all set to further development and promote our tourism globally through different activities throughout this month,” she said. She stated that such initiative would also encourage local youths to come in the field of tourism to take the full benefit of opportunities present in this sector. A member of the committee, Nosang Limboo, who is also the president of Sikkim Ornithological Society, mentioned that the celebration has included a unique activity of mountain biking blended with bird and butterfly watching this time mainly to promote eco-tourism of the State. He stated that this two-week long event will start from Pelling and after touching all tourism interest places of West Sikkim will finally conclude at Soreng. The celebration has also included a study trekking in Kanchenjunga National Park. Likewise, it has also included hiking, trekking, helicopter joyride, marathons, paragliding and other activities throughout this month. Likewise, the main venue of the celebration at Pelling SSS ground has also provided spaces for stalls of local entrepreneurs of Sikkim to showcase their items along with stalls for photographs and painting exhibition. The committee working president, Tamang, informed that a sensitization workshop on responsible tourism for stakeholders of West Sikkim and another workshop for tourism entrepreneurs were another highlights of the celebration. While stressing the digital promotion of tourism, he informed that country head and representatives of reputed online travel portals have been invited in the celebration to train local stakeholders to promote their product globally. Tamang informed that recommendations of the panel discussion in the state-level stakeholder’s workshop will be submitted to the State Government. The Tourism Department Deputy Director, Lee Pandi Targain, mentioned that tourism awards will also be conferred during the main function of the celebration. She informed that earlier the department had felicitated local stakeholders but this time it has decided to felicitate those who have been helping the State from the outside to promote Sikkim Tourism.